One of my favorite things to do is get together with friends and have a “Fun Day.” Not too long ago, we thought ice cream with all the trimmings and a few board games would be a fun time. We rotate responsibilities for the “Fun Day” and it was my turn. So, off to the grocery store I went. It was early in the morning and I thought “what kind of ice cream should I get with all the choices out there?” Not being much of an ice cream aficionado, I was toying with the exotic sorbets and fancy sounding crème’ this or that. I’m a simple person and trying to figure out the minds of my friends’ on ice cream is admittedly not my expertise. Vanilla and Neapolitan were the winners…easy and kind of like wearing black…goes with pretty much anything. Then it was on to get whipped cream, bananas and other assorted toppings. WOW!!! Do you know the price of sprinkles? 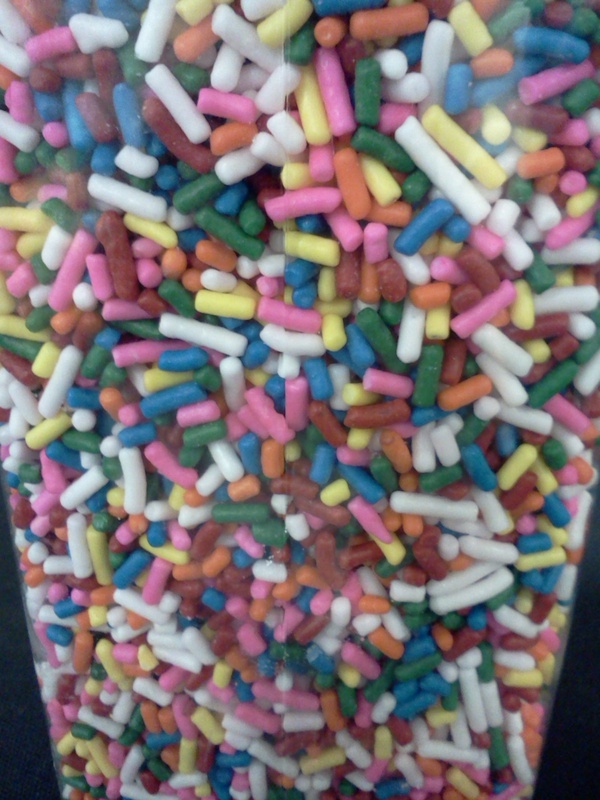 $4.49 for a large (one size only) container of sprinkles. Could I really justify sprinkles…they’re just sprinkles…no one would miss them right? Just as I was about to leave the isle without sprinkles, I thought…..”oh heck no, I show up with everything BUT sprinkles and I’m dead.” The fact that I had even thought about denying friends the joy of sprinkles was sad, embarrassing and downright horribly wrong. Everyone will get sprinkles today whether they feel they deserve them or not. Back to the house and at our appointed 4:00, out came the goods, sprinkles and all. There were the ooohs and ahhhs of whipped cream, bananas, and just about every topping. Even the Neopolitan got good reviews as it’s a classic but overlooked choice. But, the sprinkles sat there unopened as if nobody thought of sprinkles. Was there no joy left in the world? What was going on? I took action and grabbed the sprinkles with the sole purpose of knowing I would deliver the joy that makes any ice cream bowl quiver with excitement. Everyone responded with “cool, sprinkles…I never think about sprinkles” and “what are sprinkles actually made of?” to “sprinkles? Do you have any maraschino cherries?” or the best, “sprinkles, last time I had sprinkles I nearly choked to death.” Really, someone could actually choke on a sprinkle? I was not defeated. While not all took the sprinkles as seriously as I led myself to believe, they did prove to be a nice and thoughtful touch. To this day, the bottle of sprinkles three quarters full still sits on the shelf. Sad…it’s just sad. A world without sprinkles is like a world without fun, without hope, without joy. Ok, so I’m melodramatic, but trust me, they will make their way back out next “Fun Day” when ice cream is on the social calendar. All this to say yes, the price of sprinkles may be $4.49 for a container BUT the cost of not having sprinkles would have been far more. Spend the money and know that for the incredible low price of $4.49 you too can sprinkle some sunshine in to the mundane, sprinkle-less world.